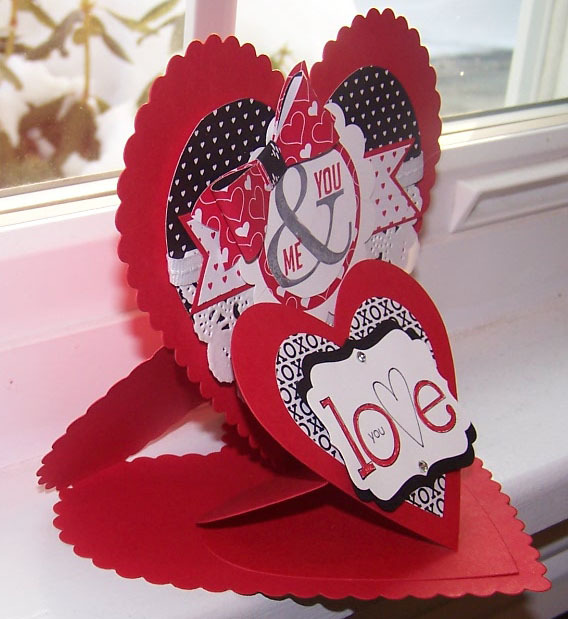 Today I am sharing a handmade Easel Card that I made for Valentine’s Day. This is a really cool 3D card guaranteed to put a smile on your Valentine’s face. 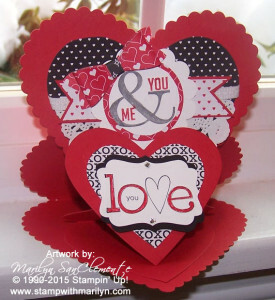 This card is made using the Heart Framelits, real red cardstock, whisper white cardstock and the Stacked with Love Designer paper. I will tape a video and post how to make this easel card. Here is what the card looks like opened up. For stamps, I used the Best of Love Anniversary set and the Perfect Pennants stamp sets from Stampin’ Up! On the front layer (outside of the card) I layered the You & Me sentiment on a piece of DSP and a scalloped circle cut from whisper white cardstock. This is layered on half a doily and a banner cut from the Stacked with Love designer paper. I accented the sentiment with a bow made with the bow punch and Designer paper. The inside layer is made with a real red card base layered with a piece of Stacked with Designer paper. 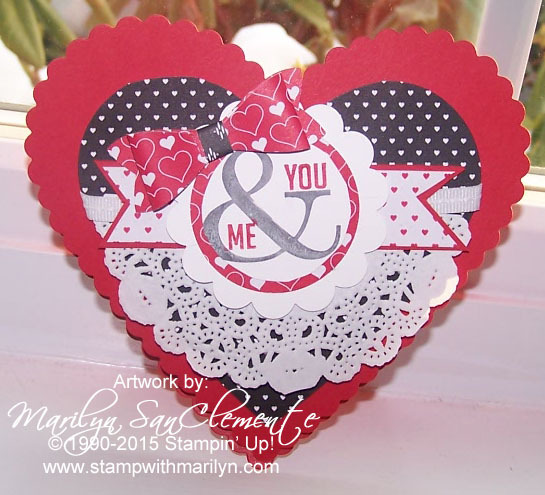 The “Love You” sentiment is punched out with the Decorative Label punch and layered onto a piece of black cardstock also cut from the Decorative Label punch. Stay tuned for my video.